Finally! After over 2 years, I found a decent cappuccino in JFK T5 at loft. Kitchen & Bar. There’s a guy there who knows how to use his machine, a Synesso Hydra, and it’s apparently calibrated. And, the Mazer grinders are calibrated too! loft. 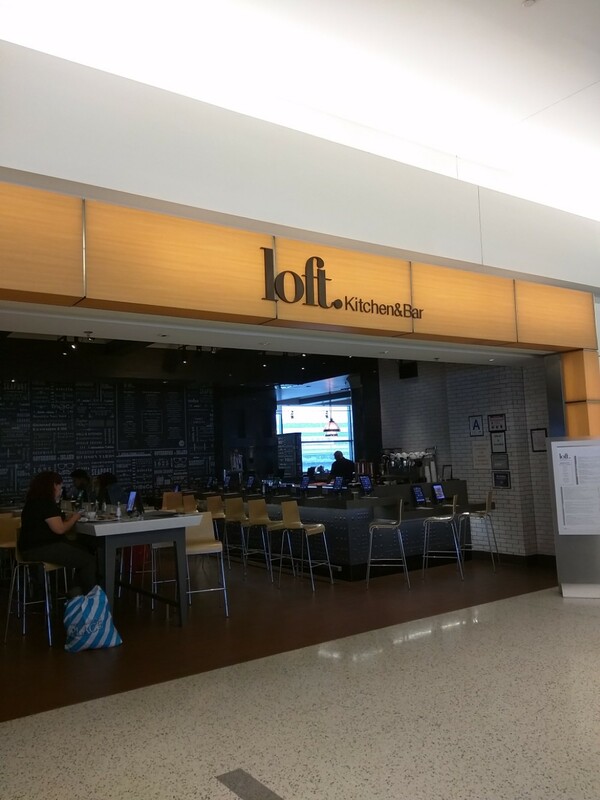 Kitchen & Bar is across from gate 25 in Terminal 5 (JetBlue) and serves a plethora of food as well as a full bar. Ordering is a little wonky because you have to use an iPad. And, the system wants to start a tab for you, so you have to remember to close it before you walk away. Also, the system defaults to an 18% tip…which is pretty ridiculous for a place that has no full waiter service. For the coffee, let’s start with the fact that the guy cleaned the portafilter after knocking out the previous puck. Every other place in T5, the employee just knocks the puck and refills… gross. His distribution attention was minimal, but there was some effort. He locked in the portafilter and walked away to go fill the milk jug. That is something I hate, but in reality, you can’t “burn the coffee” as some people will say. But, it is still bad form. However, the result was a proper double that poured in 31sec (Synesso Hydra has a pre-infusion algorithm). It had taste-able sweetness and fruit notes through the milk. The bags of beans said Rishi (NOT Reishi…if you Google it), and I’ve not seen that brand before. Real sticklers will find many faults with the workflow (the machine was dirty, no latte art was attempted), but the result was a drinkable cappuccino that made my wait at the gate more pleasant. Home Roasting – Which Roaster Should I Get? © Daniel Baird. All Rights Reserved. If it pertains to the copyright and protection of my original content, pretend you are reading the long-winded legalese right here, right now.